Magma Coliseum is the thirty-first level of Donkey Kong Jungle Beat and the second area of the Chili Pepper Kingdom. 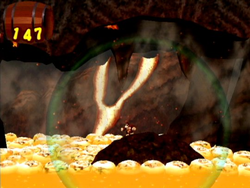 Many pillars of lava shoot towards the Donkey Kong in this level, and the stage features some unstable platforms floating atop the lava. Gale Hawg and its ilk are the prominent enemies in the level, but some more powerful enemies appear here as well, and they are the stage's main obstacles. These enemies include an angered Kobu Kokko, two Coco Pigs, who throw coconuts at the ape from their trees, and a Tar Man that emerges from the lava. If the ape bites into the chili pepper at the end of the level, he heads to the battle against Double Tusk (Thunder Roc in the New Play Control! version). The level begins on a platform hanging off of the side of a mountain. Bubbling lava is below the platforms, and a few other tall platforms are ahead, each being occupied by a Kuro Buta Pokkī. On the final platform in this area, there is a Sleep Pig Poppo sleeping. Once it is defeated, the ape can progress to a large rock platform. A pit full of lava is at the end of the platform, and at the other side of it is a Gale Hawg. When this enemy is defeated, the Kong has the ability to head over into a small gap, which leads him to a large rock floating on the fire. A Gōrumondo waits on this platform, which tilts as it sits on the top of the lava. Above it is a group of Fire Mini Igas and an empty bush. If the Gōrumondo is beaten, a Helper Monkey appears in this bush, who can throw the ape over a section of land and onto a round platform. As the platform before, this platform floats atop of the lava. Due to its roundness, the platform can be rolled over the large pit of lava. Fire Bakkies wait on the rocks above here to attack Donkey Kong, and another Helper Monkey is at the end of the area. This Helper Monkey throws Donkey Kong to a gap in the center of a giant landmass. At the end of the pathway, a dead end is reached, but a small section of the ground lowers, leading deeper into the cavern. Steam from the lava fills the cavern, and more fiery bats impend on Donkey Kong's progress here. A Kobu Kokko is blocking the path inside of the cavern on a stationary platform. Behind it is a flat platform leading to the edge of a small cliff. Two platforms float over the lava below, and a small passage is just above the second platform. A Rolling Frog is clogging up the passage, but once it is defeated, the ape can progress across a straight pathway. The ground at the of this area lowers to reveal another area with a large platform floating on top of the lava and Coco Pigs throwing coconuts from tall palm trees. The platform is not able to stay above the magma with Donkey Kong's weight, so the ape must jump up and down often while fighting the hogs. Once they are defeated, he can head over a few more platforms, which appear to be rectangular, having flat tops. Small gaps of lava are between each of the platforms, and pillars of fire shoot out from them. Some Fire Mini Igas also occupy the top part of the cavern. Deeper into the cavern are two small platforms in a large, open area. On the left side of the room, a Tar Man shoots out of the fire and attacks Donkey Kong. While the characters fight, lava shoots around the stage, adding more challenges for Donkey Kong. Once the monster is defeated, a long platform slowly floats above the surface of the hot magma, allowing the ape to head on to the end of the cavern, where there are three platforms, each of them getting progressively taller. Between the platforms, pillars of lava shoot out and block Donkey Kong's path. A giant tree branch grows above the last two platforms, and on the branch is a large chili pepper. If the Kong bites into the pepper, the level ends. This page was last edited on April 12, 2019, at 13:32.